Clover woke up unusually early this morning and got all antsy having no one around to play with. Since she had a couple of hours alone she thought she'd bake a quick bread before everyone else woke up. 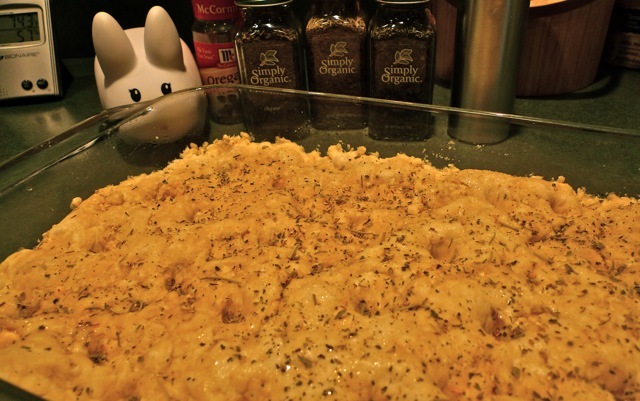 In under two hours she'd have an aromatic herbed focaccia hot from the oven for the labbits to eat. Just like the fantastic Banana Poppy Seed Bread (with fancy pants orange zest!) that Pipkin baked a couple weeks ago, this bread requires no kneading. Just prep your pan, mix the dough ingredients together, and let the yeast do its magic. You'll get the best flavored results from long, slow fermentation (rising) at an ambient temperature of 70 to 80 degrees Fahrenheit. Then poke some holes in the puffy, pillowy dough, drizzle some oil and sprinkle on some herbs and bake! Prep a 9" x 13" pan by lightly greasing and then drizzling olive oil in the bottom of the pan. Don't be shy with the olive oil. You'll get a nice crust bottom! In a large bowl, combine the water, oil, salt, flour, yeast and cheese powder and beat at high speed with an electric mixer for 60 seconds. Your dough should get smooth and tacky. Pour the batter into the pan and cover with plastic wrap or a bit of tin foil (tin foil is recyclable!). Let the batter rise at an ambient room temperature of 70 - 80 degrees Fahrenheit for 60 minutes until it's puffy. At the end of rising, preheat the oven to 375 degrees Fahrenheit. 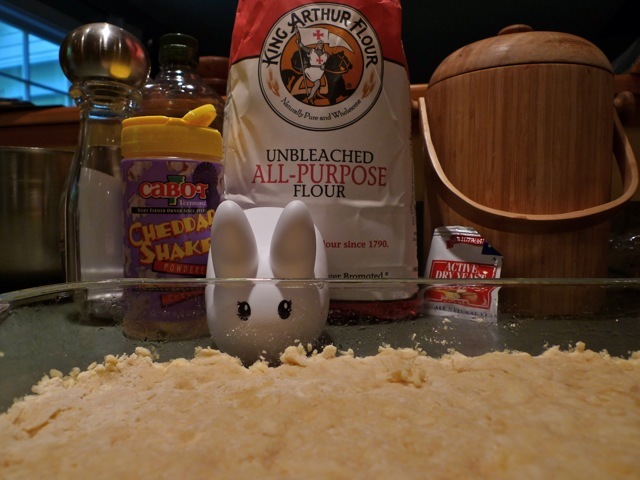 Gently poke the batter all over with a finger or clean paws. Drizzle the top with a little olive oil and sprinkle generously with dried Italian herbs. 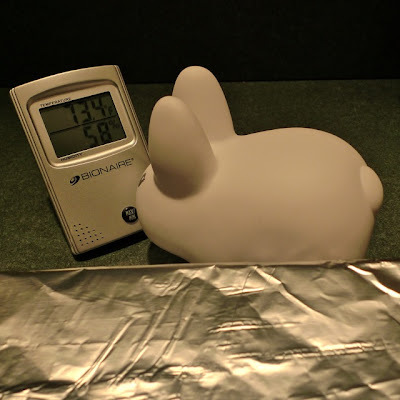 Bake until the bread is golden brown, about 35 - 40 minutes. Drizzled with oil and sprinkled with herbs. Ready for the oven! Remove from the oven and allow to cool 5 minutes, then turn it out onto a cooling rack. Serve warm or at room temperature, on its own or slice it up and make yourself a veggie sandwich with avocado, cheese, lettuce, tomato, onion and mustard. Yum! 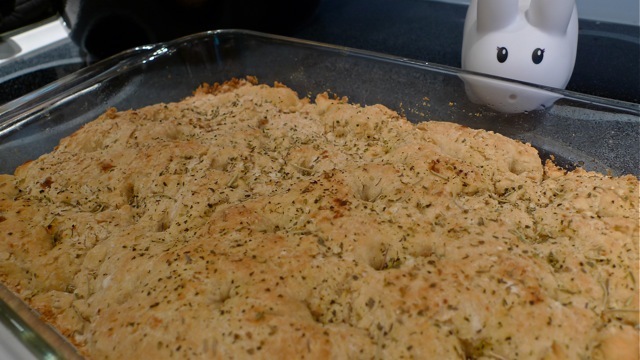 I've never made focaccia, but this definitely seems like a recipe I have to try! Thanks for sharing, and thank you for using Cabot Cheddar Shake!